Got a new product coming out that I was sent to give a try. 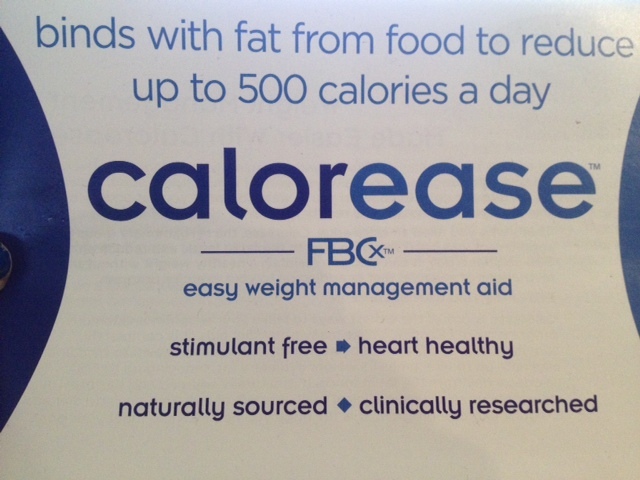 It is called Calorease- it is a weight management supplement that you take with meals that contain fat. The idea behind it is that it can bind with up to 18 grams of fat per meal by taking 2 of the tablets, and up to a total of 500 calories a day. 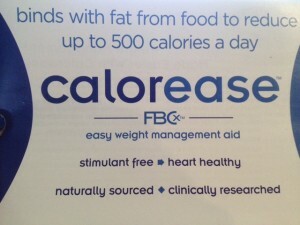 Given that you are eating a diet ample in fat, according to the pamphlet I was provided, “that’s an equivalent to 15,000 calories a month, which could be a whole pant or dress size”. … Cool! So I tried the supplement for 2 weeks. I have to be honest I do not eat a ton of fat…the pamphlet states that “most of us consume about 100 grams of fat a day” , which is not really the case for me. So sometimes I only took the supplement 2 x a day instead of the recommended 3, and even then my meals never really exceeded 15 grams of fat. 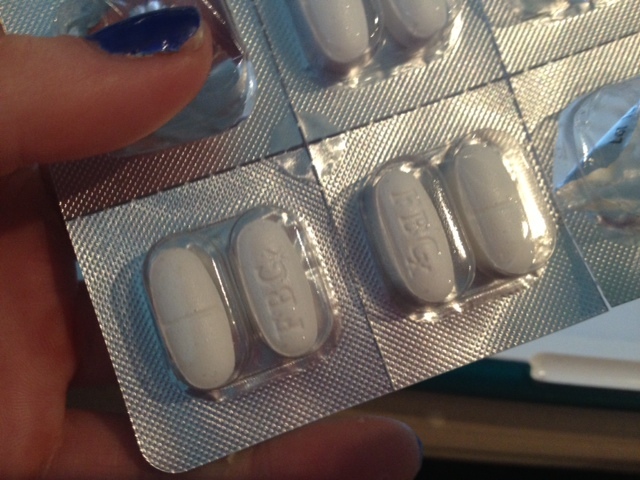 The pills are kind of big…about the size of one of those oval fish oil pills, but not terribly hard to swallow. I’m happy to report I had NO side effects, which is definitely a bonus. I did not take any more than directed. I made sure to take them whenever I indulged in peanut butter or almond butter- this food always messes up my blood sugar levels. For whatever reason, which I think is due to the high fat content, my blood sugars seem to be elevated hours after eating them. When I took the calorease, I noticed they were not elevated quite as high, which was really nice. To me, that was more of a perk than any potential weight loss. As for results? I lost about a pound. That does not seem like a lot, but keep in mind I mostly took it 2x a day, not 3 as directed, and my diet is NOT super high in fat. I am definitely not one to eat 100 grams of fat a day (well…except maybe on a peanut butter binge day 😉 ) but I think this is worth a try! Especially since I had no side effects while taking it, which is something I am always wary of when taking any type of supplement. Overall, 4 stars! I will keep this one in mind for sure. I like that this supplement is naturally sourced, and free of stimulants. I can still have my coffee! Woo! Finally!!! 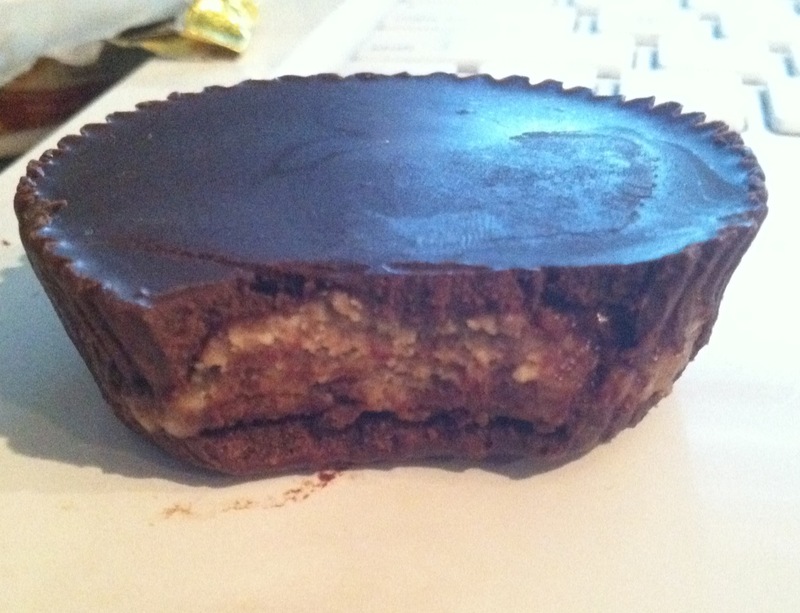 Someone has made an almond butter cup instead of a peanut butter cup! Don’t get me wrong… I’m all about the peanut buttah, and just jumped on this whole almond butter bandwagon rather recently. However, it’s refreshing to see almond butter be a star in a product other than just a jar. 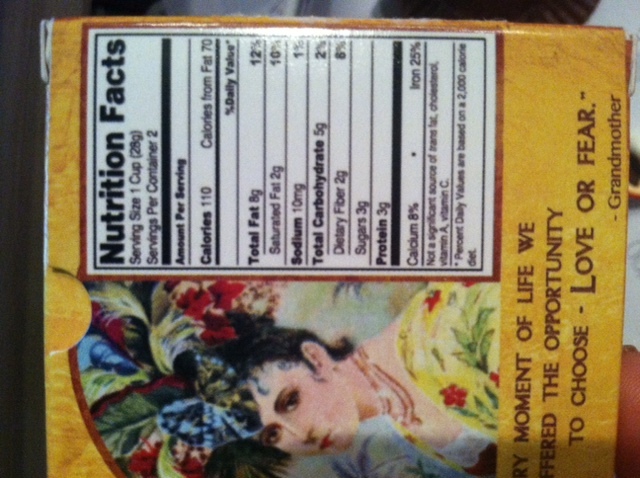 Now…when will they make powdered almond butter…? But that’s another story. I got one single cup, and then a package of two cups, with one to eat and one to share (awww). 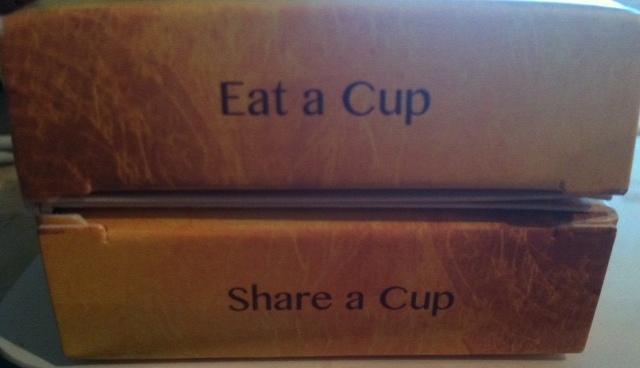 I opened the single one, wrapped generously in a pretty gold foil. It’s a decently sized piece of candy, with the circumference almost being my entire palm. 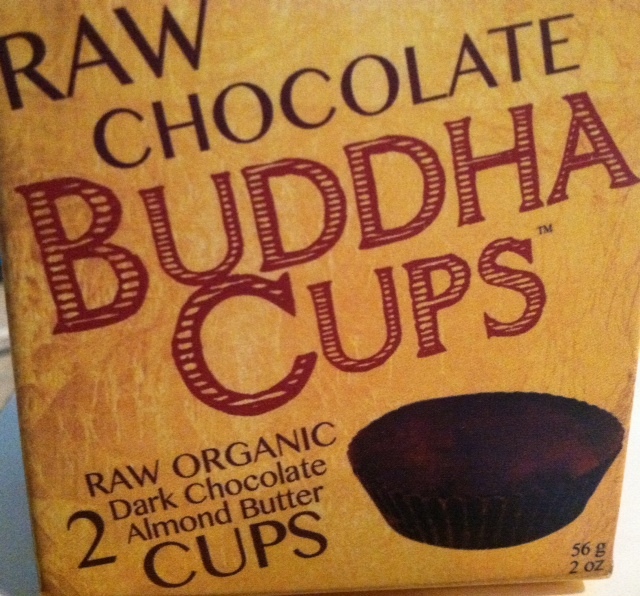 Its vegan, fair trade, dairy free, gluten free, and soy free, 78% cacao, and made in Brooklyn according to the label. The chocolate part is quite bitter, so hopefully you are a dark chocolate fan if you decide to try these. It has it’s sweetness, but the potency of the bitterness of dark chocolate overwhelms the sweetness. The cup however, is very soft and smooth, and almost melted in my hand as I held it. The almond butter on the inside was the perfect compliment. Salty and a teeny bit gritty, it provided a good amount of flavor and really gave it a salty kick. 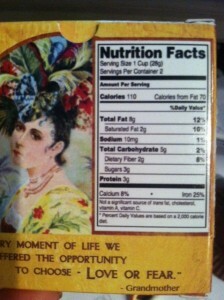 Here’s the nutritional facts. The ingredients are Cacao, almonds, coconut, palm crystals, mesquite, vanilla bean, and Himalayan Crystal Salt.